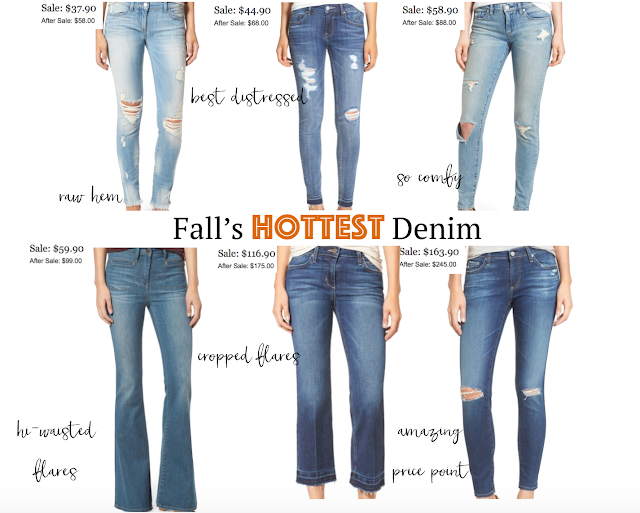 Fall is all about denim this year and there are so many great pairs to choose from. Nordstrom Anniversary is the perfect time to stock up on Fall's best denim. I especially love the raw hem style as we use to cut off our own jeans in high school, so naturally that feels comfortable. This pair is on sale for less than $38 and is to die for. I have several pairs of these and totally recommend them and again, less than $60 is another fabulous price point. They are super comfortable and run TTS. I did previously get one pair a size larger for a more relaxed fit. Dare to flare? Then these babies are high-waisted and totally flattering. Another fun pair is the cropped flares with a raw edge hem. Last but not least, I love me some AG jeans. This pair is on sale for an awesome price and these are a comfortable designer jean and will not let you down. All of these jeans are on major sale. I included the prices above to show you what they will go up to once the sale is over so happy shopping!! Reminder: #Nsale opens to the public on July 22nd, so be sure to snag the fall clothes you want now before they sell out.